“There is just something extraordinarily special about lighthouses.” So writes Captain Robert Desh, US Coast Guard (Retired) in the foreword of Lighthouses of America, a new book from Rizzoli New York. I could not agree with Captain Desh more. Even people who have lived in land-locked locales their entire lives and have never actually seen a lighthouse know they are enchanting. For those who live in coastal areas, they are cherished features of the skyline. The songs, stories, and art that lighthouses have inspired is woven into our collective consciousness as thoroughly as any myth. Even though their original purpose has now been rendered obsolete by technology that merits no pleasing architecture and requires no human custodians, these beautiful, solitary structures remain magnetic in their role as romantic symbols of safety and homecoming. Lighthouses of America, produced in association with the United States Lighthouse Society, is the next best thing to a tour of the real things. Not only do the stunning photographs transport you instantly to the harbors, bluffs, cliffs, and dunes of America’s coastlines, the accompanying narratives reveal the 300-year history of these iconic spires. It’s a trip through the past from a maritime perspective. 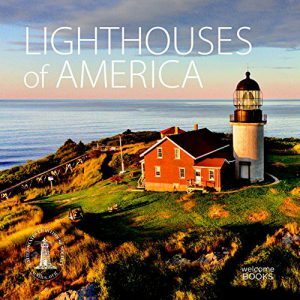 Under the direction of Editor-in-Chief Tom Beard and Tom Thompson, Graphics Editor, Lighthouses of America brings together the talents and knowledge of dozens of photographers and lighthouse experts. So many decisions must be made on a project of this magnitude and complexity. It is such a delight when the words, pictures (150 in full color), and design all come together in a package as engaging as this book. From cover to cover, it’s a pleasure to hold and peruse—not just once, but again and again—whenever it’s time for a retreat into the beauty and historic import of these charming towers. I loved learning about Fresnel lenses, too, those amazing works of glass art that gave lighthouses the ability to keep ships from harm. To paraphrase Captain Desh, there is just something extraordinarily special about Lighthouses of America. It’s informative, beautiful, inspiring, and just the right size to live permanently on my coffee table in Las Vegas, Nevada. The nearest lighthouse is 250 miles away, but thanks to this book, I can escape into the romance and history of “America’s castles” any time I pick it up. It looks like a beautiful coffee table book. I love lighthouses! It’s so well done! It’s the new king of my coffee table!